“What did Charlie Baker know and when did he know it?” asked Mark Fisher, suggesting that the nominee colluded with party leaders to keep Fisher off the primary ballot. Challenger Mark R. Fisher has called on Charlie Baker, the Republican nominee for governor, to show leadership and to urge party leaders to release documents substantiating the vote that kept Fisher off the ballot. “You want to lead the state as governor and you’re not leading on this one issue?” Fisher, a member of the Tea Party movement, chided Baker at a press conference Thursday. Fisher’s comments marked the first time that the candidate lashed out at Baker, whom he called the Republicans’ titular leader, as he faulted him for failing to lead their party through the divisive dispute that erupted after the March 22 convention. In a lawsuit filed in Suffolk Superior Court, Fisher contends party leaders cheated him out of a spot on the ballot to make Baker the sole nominee for governor. GOP leaders sharply dispute the charge, saying Fisher failed to get the necessary 15 percent of delegates that would have qualified him to appear on the September primary ballot. Gubernatorial candidate Mark Fisher allegedly demanded the money in exchange for dropping his challenge to get on the GOP primary ballot. Though he did not provide any information implicating Baker, Fisher used sharper language Thursday to suggest that the tally sheets of the delegate vote that day would show criminality by party leaders and collusion with Baker’s campaign. “What did Charlie Baker know and when did he know it?” Fisher demanded. 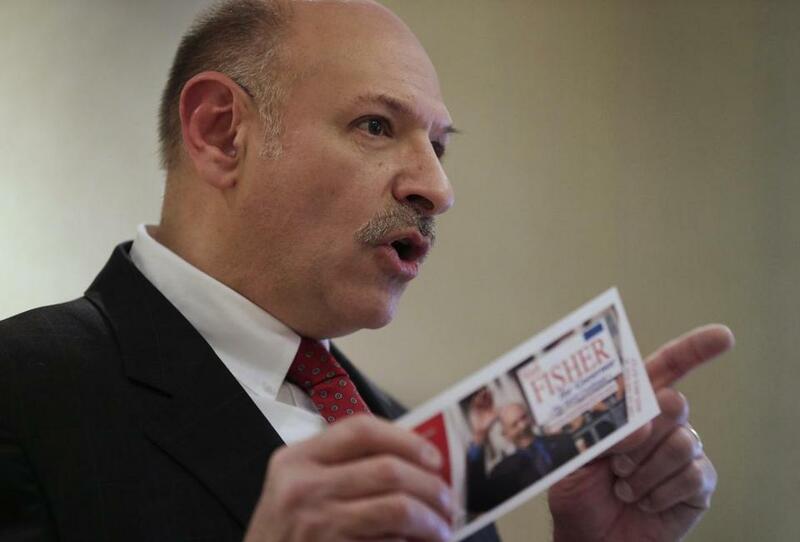 Fisher repeated but refused to elaborate on his most explosive allegation, made to the Globe a day earlier, that party leaders had offered him $1 million to get out of the race before he filed his lawsuit. He could not explain why someone would have made the offer to a newcomer whose chances of making the ballot were always in doubt. “Why is the MassGOP afraid of me? I’m a political outsider,” Fisher said. Fisher refused to name the state committee member he says made the offer, erroneously citing a gag order from the court. (The confidentiality order the judge allowed protects only delegate-specific information on tally sheets.) Fisher later said that his lawyer advised him not to name names. He also could not explain how the party, which currently has just over $200,000 on hand in its state campaign finance account, could have produced the money. The Superior Court judge hearing Fisher’s case, Douglas H. Wilkins, has scheduled a hearing for Friday to determine whether the trial, set to begin June 16, could be averted by placing Fisher’s name on the ballot immediately. The GOP proposed such a resolution this week in a court filing that reversed its previous objection and offered to grant Fisher the ballot access he demands, in exchange for postponing the trial, production of documents, and determination of any damages until after the election. 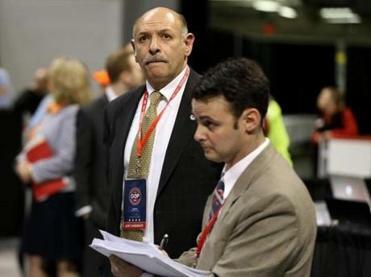 But Fisher’s lawyer opposed that motion in court, saying he wants to compel the GOP to produce evidence, particularly the tally sheets that would document delegates’ votes from the convention. Fisher called the press conference after the Globe published details of a letter from the GOP’s attorney saying that Fisher had demanded $1 million to drop his lawsuit, a figure his lawyer called a “starting point” in negotiations. Fisher said that he threw out that number because it was what was originally offered to him in December and because the party’s lawyer had been pressing him for a dollar figure at which he would settle. He said he never intended to drop his case without getting on the ballot and securing the tally sheets. If the other conditions are met, Fisher said he would settle for damages: at least $70,000 in legal fees and the $30,000 cost of signature-gathering efforts he had to incur.